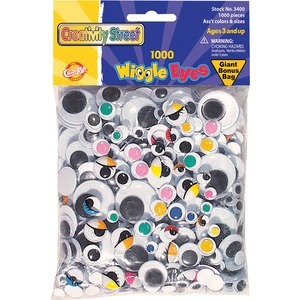 Assorted wiggle eyes are perfect to decorate craft projects. Various designs include eyes of painted, black/white, oval and round. Sizes include 4mm, 5mm 7mm, 8mm, 10mm, 12mm, 14mm, 15mm, 18mm, 19mm, 20mm, 24mm, and 35mm.